Shared mode has been designed for pool devices, such as an iPad cart / trolley in an educational environment where each device is used by multiple users. Personal mode is more suited to devices that are used by one individual. Security options – Found within Settings on the log in screen. Pin / Complex Passcode & Touch ID support to protect access to files held on the device and prevent unauthorised access to your network. Login options – Multiple account profiles can be created to enable fast user switching between Foldr installations. Login can also be set to automatic. 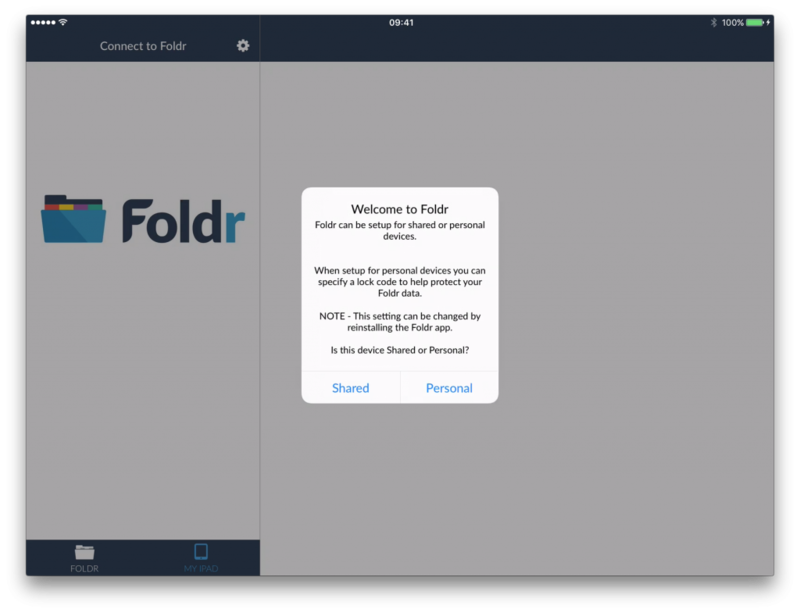 When the app is in Shared mode, only the ‘classic’ login screen is available and the ‘My iPad / My iPhone’ area of the app is automatically cleared when the user logs out or the app is closed (double tapping the home button and swiping the Foldr app up). This resets the app back to a clean state ready for the next user. Files held in the My iPad / My iPhone area are persistent if the app is in Personal mode and remain until manually deleted by the user. Note – You cannot switch modes once the app has been installed and mode selection has been made. You must remove and reinstall the Foldr app.